Special Announcement: Introducing the NEW Crucial Conversations! We’re celebrating the launch of our new training product, Crucial Conversations 4. Celebrate with us by entering our giveaway for a free training scholarship. 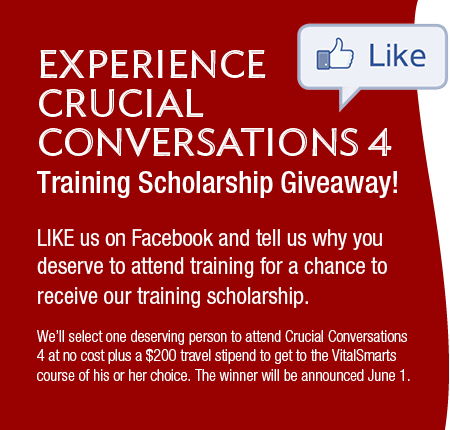 To learn more about Crucial Conversations 4, visit vitalsmarts.com. Comments Off on Special Announcement: Introducing the NEW Crucial Conversations! Previous PostBefore & After: Bringing a Canoe to a Gun FightNext PostWhen Your Boss Pitches a Bad Idea . . .